here is the lkink to see the video! Very often, piano parts are hard to cover because of the use of two hands. In general, if you want to cover a piano song on guitar, you have to work using fingerpicking technique so that you can hear bass and melodic parts (as Tommy Emmanuel does for example). In this particular song, the piano part is very simple, there are no chords for the bass part just single note. This will help to adapt it on guitar. For this part of the song, no real difficulty. There are only three chords : Gm, Dm and Cm. The only think you have to be careful with is the bass note chich changes on each chord. In the end of the first measure, you can see the bass (G) goes down two frets (F) before going down one more fret (E) at the beginning of the second measure. So, for the G you have to use your ring finger and then (for F and E) your index finger. Don’t forget to play this bass change, it’s very important to be as close as possible to the original sound. 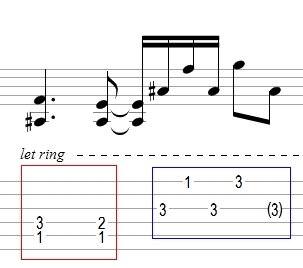 The chords for this part are quite easy to play too : Gm, Dsus4 (play a D chord and add your pinky on the 3rd fret on the high E string), D, Cm and F.
The piano part is quite hard to hear at that moment in the song, what I play is just an arrangement. Anyway, the chord positions are very simple, just try to play a good rythmic pattern (mine is very easy to follow). The chorus is played on guitar for the first part. The second part is a arrangement I made to avoid hearing a « whole » within the song. So the first part requires a dropD tuning (the low E string is tuned down a whole step to D). The fingerings are once again very simple, the only thing you have to take care of is the « Let Ring » indication : each note has to ring, so be careful not to hit the strings with one of your hands. The second part is an arrangement involving both guitar parts and *** parts (couldn’t say the instrument here). Measure 15 starts with a A# power chord moving to a A# with diminished 5th (E played on 3rd string, 2nd fret) (Red part). For this part you’ll have to use index finger and ring finger first, then index finger combined with middle finger. You index finger has to cover all the strings, don’t release pressure you’ll need it for the next part. The ring finger will remain ont the G string (3rd fret to play a A#), the notes played on the high E string will be played by the index finger and the pinky (blue part). Remember that you have to let the chord ring during this part. The end of the song doesn’t involve new parts, the chorus is repeated several times but the structure is not always the same. Don’t forget to listen to the song to know when it happens and also to look at the annotations I added above the last measures. I trully hope I helped you to learn this song. Feel free to give feedback!